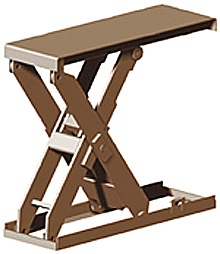 Capacities from 2,500 to 6,000 lbs. Vertical travel from 24" to 60"
Made for heavy loads in small spaces, this scissor lift has stability and outstanding performance despite its smaller platform and base size. An economical lift with great standard features like controlled descent safety fuse, reinforced steel legs, polyethylene hydraulic reservoir and maintenance locks. Ready to use with pre-plumbed hydraulics and minimal wiring required. Backed by manufacturer's warranty.